An introduction to the Hall. The Hall is situated in the English Midlands – in countryside between Bromsgrove and Kidderminster. Most of the Hall was built in the 1580’s by Humphrey Packington, who built on the site of an earlier Medieval Hall. After Humphrey died in 1631, the Hall passed to his daughter Mary Yate. Mary lived here until her own death aged 1696 aged 85. After Mary’s death, the Hall passed through marriage to the Throckmorton family who still own Coughton Court near Alcester. For nearly 200 years the Hall was left to deteriorate. Panelling, pictures, books and even the great staircase were stripped out. In places the roof fell in and allowed the elements, ivy and vandals to do their work. In 1923 the Hall was bought by Mrs Ellen Ryan Ferris and given to the Roman Catholic Archdiocese of Birmingham who started the restoration process that continues to this day. Humphrey Packington was a Catholic in an age when it was forbidden to practise this faith. Despite official disapproval, Humphrey continued to attend Catholic Mass and he also sheltered Priests. Harvington was used as a centre to receive Priests who were trained on the continent of Europe before being smuggled into England. Penalties for these Priests could be extremely severe and households sheltering them were also punished. Houses could be searched by Priest hunters called ‘Pursuivants’ who would try to catch households unawares in an attempt to capture Priests. It was for this reason that many houses had hides or ‘Priest Holes’. Many of these hides can still be seen across the country but Harvington has the finest set of hides remaining anywhere. Many of these were made by the master hide builder – Nicholas Owen. 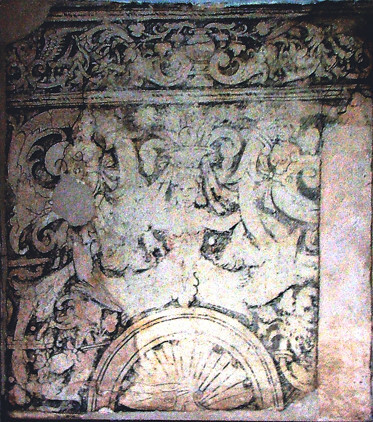 As well as the hides, there are many Elizabethan wall paintings – these were hidden under whitewash until they were discovered in 1936. Nowadays, the Hall is a quiet and peaceful place – it is hard to imagine that it is associated with such a dramatic and often bloody period of English history. The Hall is enjoyed by visitors who learn about it’s history through a guided tour or perhaps to enjoy the regular series of ‘living history’ days when the house is brought to life by teams of re-enactors. In recent years the Malt House was renovated and opened to the public. Visitors can now learn more about the people who inhabited and worked in the Hall in the past as well as to find out more about how the Malt House was used in brewing.